I haven’t tried spring turkey hunting for a number of years. I find it to be one of the most frustrating hunting experiences I’ve attempted. For one thing, you’ve got to get up very early in the morning. I am much more a night-owl, than I am an early-bird. But if you are after turkey, you’ve got to be out there before first light. Then, the productive time window for turkey hunting is very short. It runs from first-light to maybe 9:30 AM at the latest. After that time, it is very rare to even hear a gobble, and even more rare that you would be able to coax a late-morning gobbler toward you with your calling. I was actually successful in calling in a big bird some years back. The only thing was that my buddy got the shot instead of me! I’ve got to admit, that when you hear that gobble, and the bird is responding to your calls, it is one of the most thrilling experiences in the world of hunting! But again, it’s very frustrating when you are calling, the bird is responding, but he’s not coming in for whatever reason. Eventually you hear the gobbles get weaker and weaker, then finally stop. Arrrrgh! There was a time, in the not too distant past, when rifles were legal for both spring and fall turkey hunting. My turkey gun of choice was a Savage Model 24 combo gun in .223 over 12 ga. I still have that gun, but the law has outlawed its use on the big birds. I had hope back then – if I could at least see the bird, that I would have a chance. Even if he did not choose to come to my calls, I could flick the barrel selector to .223 to reach out and touch. 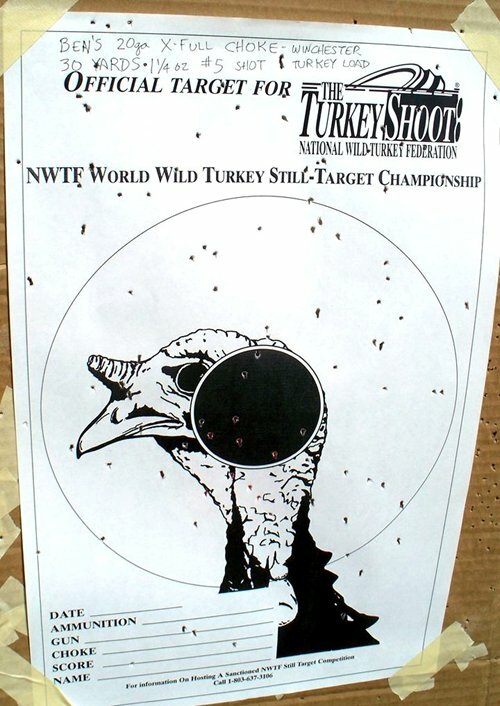 So when the law was changed to make it shotgun-only in the spring, I gamely tried shotgun hunting a couple times, experienced the frustration, and eventually just stopped putting in my application for spring turkey. I switched over to fall turkey hunting, where it was still legal to hunt with a centerfire caliber. And there, I had my first and still-only success at Arizona turkey hunting. I took a hen out of a flock with a rifle-caliber pistol, my Lone Eagle firing a reduced-power .260 Remington load. But alas, now even the fall hunt is a “Limited Weapon – Shotgun Shooting Shot” hunt. As a result, I lost interest in turkey hunting completely for the last several years. I have been hunting javelina with Number One Son, Ben since he was old enough to do so (age 10). We had not missed a spring season hunting together since. But he graduated high school last year and is now attending college at Northern Arizona University in Flagstaff. Getting away from a busy college life in Flagstaff for a late February javelina hunt near Nogales (our javelina hotspot) would be very difficult now. So we discussed the options and decided to try our luck with a turkey hunt this year instead. 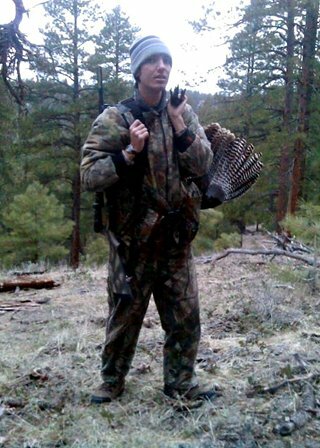 The turkey hunt was later in the year, and actually ran past the end of the NAU spring semester. This was great. There would be no interference with his school schedule. We put in our application for Unit 12A, the North Kaibab Plateau. Game and Fish says that there’s a good population of turkey up there. I had once tried a fall turkey hunt up there – never did see any on that trip. When the spring draw results came out, we got the great news that we got tags. Despite my past frustrations, I was rather excited and very much looking forward to the hunt. It would be a great change of pace from our routine southern Arizona javelina hunt. I was good-to-go for a turkey gun. When they outlawed centerfire calibers for spring turkey hunting, I picked up a Benelli Nova pump gun in turkey configuration. It is wrapped 100% in Realtree green camo, can handle up to 3½” 12 ga. shells, and features a 24” barrel length. It’s my humble opinion that the thoroughly modern Nova is the best pump gun on the market today. To the basic gun, I added a B-Square saddle mount and a Tasco 2½ x 20mm Bantam shotgun scope. This scope features a circle-plex reticle. The size of the circle approximates the full-choke spread of pellets that comes flying out of the muzzle of the shotgun. 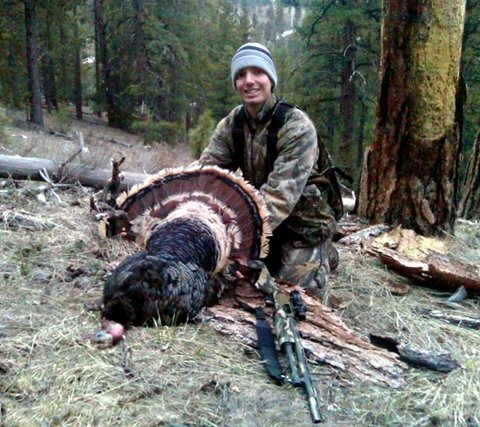 The one other addition was a Kick’s Gobblin’ Thunder ported super-full turkey choke. The choke constriction is .660” (the nominal 12 ga. bore diameter is .729”). Back when Ben started hunting, we got him a Mossberg Model 500 Bantam youth shotgun. (Yes, the Tasco and the Mossberg are both named Bantam.) It’s a 20 gauge, has a 20” barrel, and is fully camo’d in Mossberg’s proprietary OFM camo pattern. It came equipped with just a single Improved Cylinder choke. We picked up an extra-full turkey choke for this gun as well, though not one as fancy as a Kick’s. We’ve taken it out for turkey a couple of times on those unsucessful seasons (Sam did get a grouse with it), but mostly it’s been used for dove hunting and for club shotgun matches. Originally it came with a short youth stock, but it also came with a coupon to get a full-sized stock at half price. We took advantage of that option several years ago. I’ve become a big believer in “shotgun sniping”. Since I can’t use the Savage combo gun on turkey anymore, I’ve turned to using it as a “quail sniper”. Gambel’s quail are such runners that I don’t even try to get close enough to flush them and knock them out the air anymore. I take the Savage after quail with the full intent to ground-pound them at distance through the scope with a full choke! 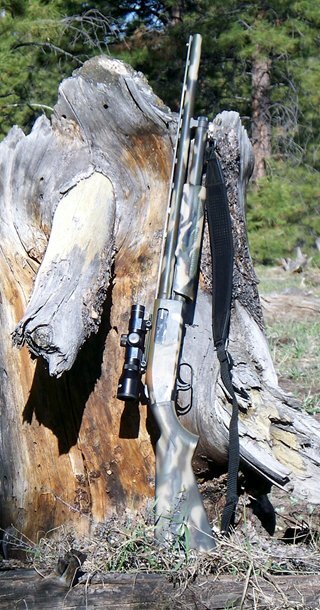 The .223 barrel is the bonus gun I need if I happen to spot a coyote or a jackrabbit while I’m out chasing quail. A scope on a shotgun allows you to perfectly dial-in the center of the pattern to the point of aim. With a simple fixed bead system, you can’t get a perfect adjustment of the sights to the pattern center. You might get lucky, but chances are that it will be off a little. You’ll have to remember how far off and apply Kentucky-windage and/or elevation in the field. I had what I consider a good setup on the Nova, but Ben’s gun was not scoped. I really like that inexpensive Tasco shotgun scope with the circle-plex. As I mentioned, that circle-plex really helps you envision the shot cloud within your aiming field of view. I wanted to get Ben’s gun set up similarly. 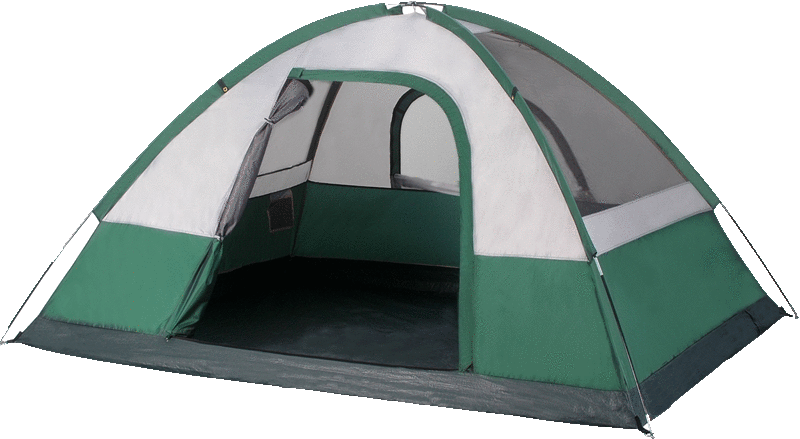 The problem was that this particular Tasco was discontinued and unavailable at any retailer. eBay to the rescue! I was able to find several used ones offered for sale by private parties on eBay. I placed a bid, won it, and soon a 2½ power Tasco Bantam shotgun scope with Circle-Plex reticle arrived on my doorstep. The next step was to figure out how to mount it. The M500 is drilled and tapped on top of the receiver for a scope mount. A quick browse through MidwayUSA.com turned up a Weaver top mount scope rail for a Mossberg M500 for $7. When it arrived I discovered that I had a new problem. The included screws were bigger than the screw holes on the little Mossy. The hole pattern was the same, just the screw size was too small on the gun. This must be a difference between the standard M500 and the Bantam youth model. Or maybe in the years since we got the Bantam, Mossberg upped the screw size. Rather than try to use undersized screws on the mount, I figured that my best option was to re-drill and tap the holes on top of the shotgun’s receiver. I went to Lowe’s Hardware, then to Ace Hardware, but neither place had the required tap for 8-40 screws. So it was back to MidwayUSA.com which had a kit including the tap and the correct-size drill bit to do the job right. So after a little simple gunsmithing, Ben’s Mossberg was now scope-equipped. Since Ben was living in a dorm up at NAU, the task of zeroing the scope fell to me as well. I built a quick and simple target frame out of 1x2 furring strips onto which I stapled a cardboard pallet square from Costco. I’ve walked in to Costco a couple times now, grabbing a couple of pallet squares for target backers, and walked straight out the front door with no one saying “boo” to me. I figure that if someone did ask, I’d just tell them that it was for a school science project for my kid. Who’s gonna argue with that? Here’s my procedure: With a large blank piece of cardboard in front of me, I paste an orange sticker in the center for an aiming point. The distance is 20 yards. From a benchrest, I take careful aim at the sticker in the center and let go with a charge of regular-old birdshot. I walk down to the target and place a second sticker in the apparent center of the swarm of holes. Back at the benchrest, I re-setup the gun to aim at the original aiming point, and hold the gun firmly. Without allowing the gun to move, while looking through the scope, I have an assistant tweak the scope dials so that the second sticker moves to the center of the crosshairs. Next, I cut out another piece of cardboard big enough to cover most of the holes from the last shot and tape it in place. Now I stick on a new aiming point at the center. Repeat the procedure until satisfied. At this point it’s time to give a big shout-out to Mark Snyder. Mark has spent a lot of time on the North Kaibab chasing bucks. I mentioned that I tried a fall turkey hunt up there once and never caught a glimpse of a bird, nor even any evidence that birds really lived up there. Mark gave me a general area where he had seen birds on his past deer hunts. I really had no idea where to start. As you probably know, we had a heck of a winter this year for snowpack. It was mid-May and the road from Jacob Lake to the North Rim of the Grand Canyon was still closed. Ben and I had originally planned to head up there as soon as school wrapped up, but we ended up postponing for almost another full week because that main road was still closed. It’s a good thing that the turkey hunt was three weeks long, which gave us the luxury to delay. We decided to head up two days before the road opened, planning to camp in the forest wherever we could, with the intent to move our camp to our desired area when the road opened. As it turned out, even though the paved road was closed, the forest roads were open and accessible. There was still a little bit of snow on the forest roads, but not enough to be a problem at all. We were able to head directly to our intended area when we arrived late on a Thursday afternoon. We found a nice spot, deep in the forest, to make camp. We got everything set up well before dark. The evening got pretty cool, and the dinner of Stagg Chili Laredo really hit the spot! Over dinner, I related to Ben my very first experience with turkey hunting. It was my very first “big game” hunting trip of any kind whatsoever. I figured that turkey was probably the best place for a beginner to start. I did not go as an apprentice with anyone else. I went out all alone. I was basically teaching myself how to hunt. I had read up all that I could about spring turkey hunting. I watched some videos, and learned how to make reasonable hen turkey noises with a mouth call. 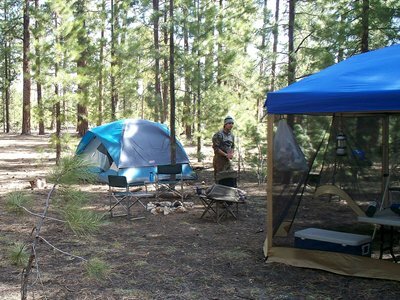 I drove up to the White Mountains in eastern Arizona, to a random spot deep in the woods and set up my camp. I had no idea if there were any turkeys in this area. I went to bed, woke up when the lights came on, and stumbled out of the tent to make myself a bowl of cold cereal for breakfast. While moving the spoon to my mouth, I heard a distant, “gobble-wobble-wobble”. I stopped the spoon in mid-air. Did I really hear that, or was it just my imagination? I strained my ear to the silence of the forest … “Gobble-wobble-wobble!” There it is again, and it’s real! I droppped the bowl, ran to grab my gear and my gun and started heading toward it, making some hen yelps with my mouth call. The turkey gobbled again. I couldn’t be sure whether he was responding to me or not. I found an open grassy area on my way toward the sound, and set up a hen decoy. I found myself a comfy tree to sit against at the edge of the open grassy area and commenced to continue trying to call the bird in. I got several more answering gobbles, but the bird never came in before it shut off. Well never mind that he didn’t come all the way in, just hearing that sound and talking back and forth with him was great excitement! I told Ben this story to explain the plan for tomorrow morning. We were going to get up at first light, and just hang around camp for awhile to see if we could possibly get a bird to talk to us right here. We had set up our camp in a random spot in the forest, just as I had on that first trip to the White Mountains. It could happen. We got dressed in our insulated camo bib overalls (cold morning, brrr!) and crawled out of the tent. We grabbed our jackets, our turkey vests, and slung our guns over our shoulders. I reached in to the pocket of my vest to grab the mouth call. I let out a few strident hen yelps in a couple different directions. Almost immediately, we received a distant answer in the direction of the deep canyon to the south of us! Whoa! “Come on Ben!” We started heading that way. I called a couple more more times as we headed toward the edge of our ridge where it dropped off into the canyon. I have only about 50% hearing in my right ear, so I know that my sonic direction-finding abilities are not very good. To me, the sound seemed to be coming from the left over the edge, but Ben said that it was more from the right. I told him that I would follow him, knowing that his directionality was better than mine. We continued to call as we worked our way toward the edge. We kept receiving immediate answers, louder and louder each time, so we knew he was coming in! When we reached the edge, where the steep slope started, I directed Ben to grab a tree to the right to sit, and I would go sit that tree over there, about 15 yards to his left. BOOM! The sound of Ben’s gun shattered the forest quiet. I saw the flame of the muzzle blast in the dim early morning light. I got up and headed toward Ben. “Well, did you get him?” “Yeah Dad, he’s right there.” I looked in the direction that Ben was pointing and saw the bird flopping on the forest floor, trying to escape down the slope, but not having much success. Ben asked if he should shoot again to finish him. I told him no, he’s not going anywhere. Soon enough, the big bird expired. This was just too awesome! It wasn’t even 20 minutes since we unzipped the tent and crawled out, not even 100 yards away from camp! As the title of this story suggests, it was absolutely a textbook spring turkey takedown! We set up to take some photos, but my better camera was not cooperating. It can be balky at times, and I think the cold of the morning was affecting it. I ended up having to use my cell phone camera. Thankfully, this phone takes better pictures than most phones, so the trophy photos didn’t come out all that bad. Well, for the second time now, I had called in a spring tom turkey only to have someone else take him down. Somehow it doesn’t feel as bad when your son gets the bird versus your buddy tagging him! We went back to measure the actual distance that the shot was taken. We measured it at 25 yards. That was just about the perfect distance for that 20 gauge. Ben got the bird plucked and field dressed while I had a small bite to eat. After we got the bird all packaged up and settled into his new home, the ice cooler, we decided to drive in to Jacob Lake to celebrate with a real breakfast of eggs, bacon, and pancakes. Ya can’t beat that! For the next several days, we had fun exploring the area around us. Ben had his bird, so he no longer had to lug his shotgun around with him. We found several areas, where it looked like turkeys just had to frequent. We got up before light every morning, called and walked, called and walked, but we heard no more gobbles after that first morning. It was now the last week of the season. There are actually two interleaved hunts. The guys with the early tags started their hunt on April 23rd for one week. Their season then closes for a week as the second wave of tag holders takes to the field. After an exclusive week for the second wave, the final two weeks of the hunt is open to all tag holders. We were second-wave tag holders, but we had to wait for school to wrap up, then we delayed because we thought that the woods were inaccessible, so we got here actually quite late in the season. I consider us very lucky that our bird was still hot to gobble at all. With the bird on ice in the cooler for the fourth day, we figured that we ought to head home and get him in the freezer. Our ice actually held up quite well as the temperatures stayed cool. So no bird for Dan this year, but with Ben tagging, it was a great hunt, and probably the start of a fantastic new spring hunting tradition for us!